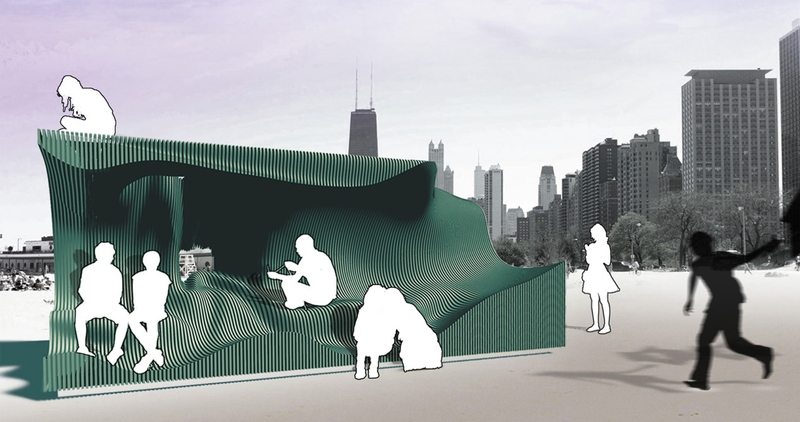 Our proposal for the Chicago Architecture Biennial Lakefront Kiosk derives its’ formality and function from the immediate juxtaposing contexts, as well as embracing and ultimately aiming to consolidate the diversity of the lakefront activities. The program is meant to provide a place for meeting, gathering, eating or shopping, whilst also becoming an inherent hub for learning, engaging, exploring, and indulging: a one-stop-shop to get a famous Chicago hot dog while listening to live music from local musicians. organically scrapped, carvern-like flexible space toward the lakefront. 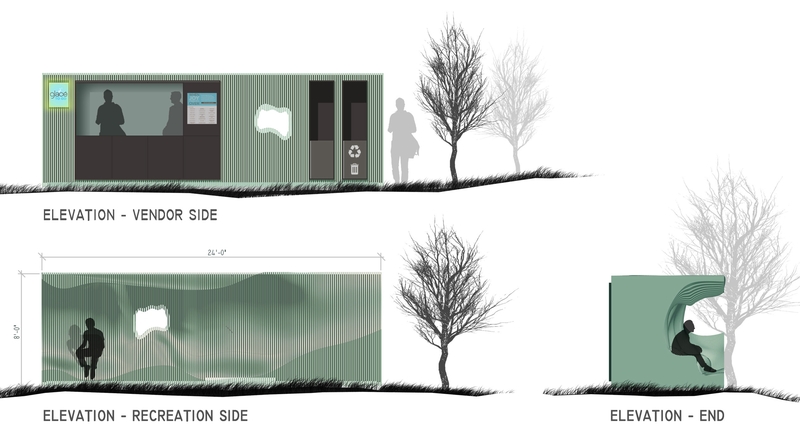 The freeform represents informal space planning with no set agenda or program until the users themselves define it. 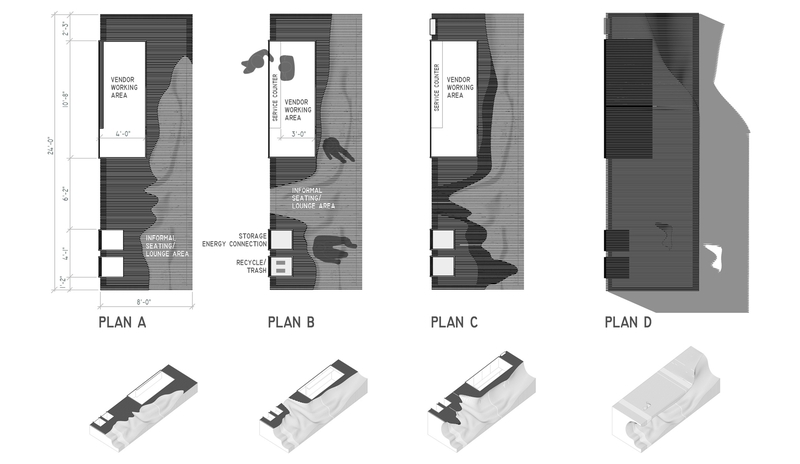 The vendor space is more rigid with its box-like massing creating a relationship to the city’s predominant grid. It becomes clear that this space is meant for a planned purpose, yet the type or style of vendor for the kiosk remains flexible and can be dependent on its’ ultimate location along the lakefront. With these smaller boxes within a box, the vendor can choose how they want space to function by opening or closing the panels as necessary. This inherent contrast is definitive from each side of the box, formally starts to blend into one another to create subtle variations in both shape and usage. Portions of the carved mass begin to sweep back to the city’s edge and out through the roof, creating playful gestures on light, cross ventilation, and general curiosity. Finally, the kiosk’s materiality is seen as a cross-interpretation of the structured, repetitive definition of something man-made or industrial and the tendencies of something more natural. The integration of the wood ribs provides a response to both ends of the spectrum. The continuous use of this uniform rhythm of the wood ribs, carved naturally along one side, and structurally defined along the other, help evoke a common relationship between both sides.